MOXI, The Wolf Museum of Exploration + Innovation opened to the public in February 2017 with a nonprofit mission to ignite learning through interactive experiences in science and creativity. 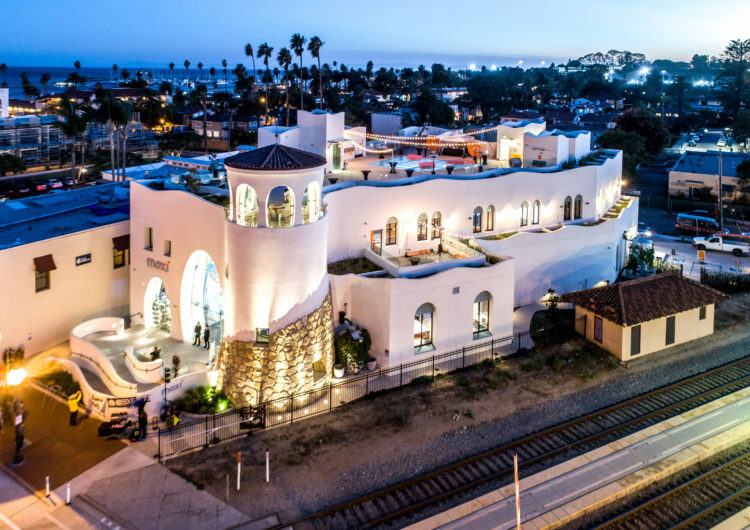 The beautiful building – designed by Barry Berkus and AB Design Studio – seamlessly transitions from a whimsical sandcastle-inspired exterior with smooth curves and delicate wrought iron details to a cool industrial environment inside. All three floors are filled with interactive science-based exhibits, encouraging guests of all ages to play, explore, and learn. 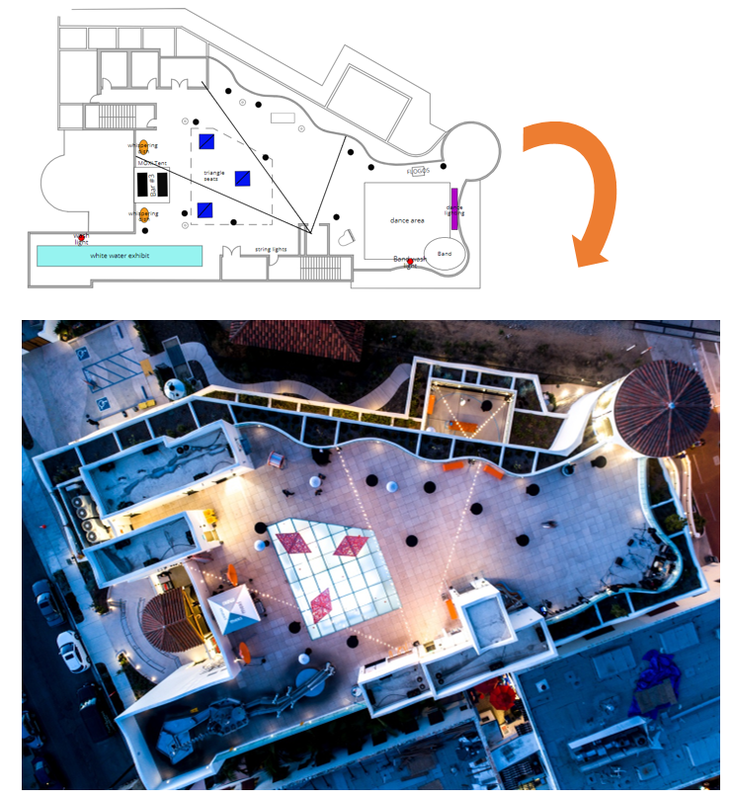 While the museum bustles with visitors during the day, at night, MOXI transforms into the ultimate event space – with a prime location in the heart of Santa Barbara’s Funk Zone, stunning rooftop views, and enough exciting games and activities to keep guests entertained well into the evening. Planning and managing the steady stream of varying and untested event setups, with everything from complete weddings to international corporate receptions, and all of the popular MOXI-hosted parties in between. While those nice curvy walls and fun exhibits visually excite and encourage engagement, they are certainly not easy to plan a standard plated dinner service around! MOXI desperately needed a tool that could help them organize vendors and their equipment with an accurate visual of what could really be put in the different spaces available. We took all of the museum’s original marked-up floorplans, photos, and endless notes to create a precise set of digital diagrams for all three levels of MOXI. As MOXI started to use AllSeated more, the MOXI Events Team gained access to a library of resources and plenty of online support for not only their internal staff team, but their clients and vendors as well. MOXI’s quarterly adults-only Afterparty events started less than two months after opening and they had to learn how to host a one-of-a-kind party fast. Not only did they want to host as many willing adults as possible in the museum space, but they also wanted to feature local food, drink, entertainment, and special STEAM-based programming that could excite and challenge a diverse crowd. AllSeated’s diagrams and collaborative planning tools helped to organize the entire setup and gave the extensive team of event partners and MOXI’s newly recruited volunteers a much better idea of where things needed to be. As a nonprofit, MOXI relies on having all hands on deck to make these events successful. Thankfully, the Afterparty experience was an instant hit and by the end of summer MOXI was selling more than 400 tickets within minutes of them becoming available! The team has enjoyed seeing these events evolve and is excited for the return of the Afterparty series for its second year. Another big experimental success story was produced in collaboration with Jonnum Media, Islay Events and American Honda. 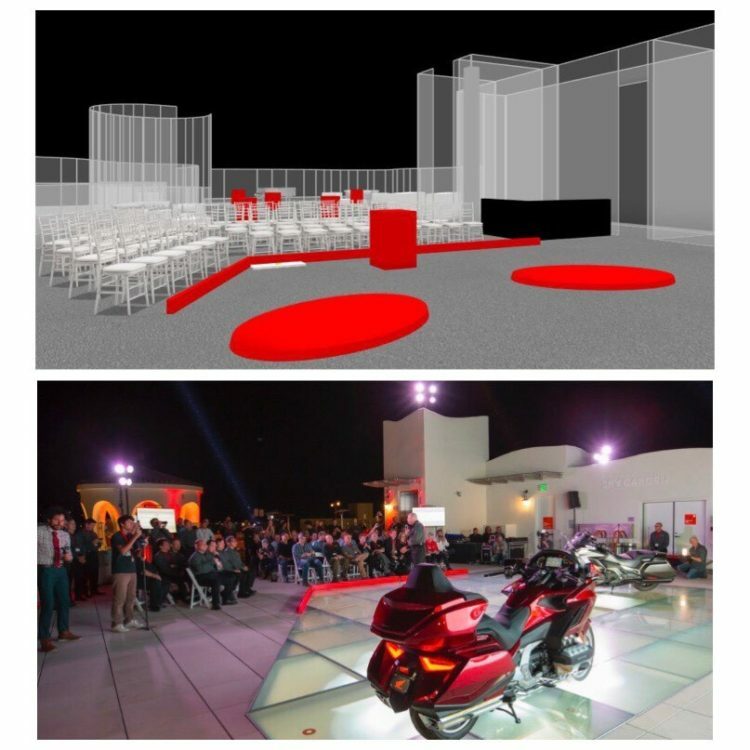 MOXI was approached by Jonnum Media to host the international media premiere for the newest model of the classic Goldwing touring motorcycle, with the caveat that Honda wanted to somehow get the motorcycles up to the roof and stage them on the museum’s glass floor with a giant 12’ by 24’ LED screen framing the space. MOXI agreed to close the museum for the day and (with the help of their trusty AllSeated floorplan diagrams) put everything together in time for an exclusive presentation and international live streamed product launch. Executives flew in from Japan and all the top motorcycle reporters and media representatives were invited to get a first look at the bikes in this beautiful and innovative space. Motorcycles were staged throughout the museum and then uncovered for guests to document and admire after the big reveal. Unexpected AllSeated Tool! A unique request was made was for a short red marker separating the audience from the speakers during the main presentation. Islay Events was able to use the AllSeated shape tool to visualize and gain approval for the unique pieces. While MOXI has hosted a variety of rehearsal dinners, receptions, and even photoshoots since opening, it was only in the past month that they laid the foundation for the first “real wedding” couple to have their ceremony at the museum as well. A strong trend has emerged recently of couples craving a more unique celebration space that speaks to their passions, playfulness, and philanthropic ideals – which is perfect for MOXI and all that it represents! MOXI used AllSeated’s floorplan tools to visualize both the ceremony and dinner set up, making sure there was adequate room for sitting, socializing, serving food, and dancing. With the curvy roof lines, it was so helpful to be able to try out different ceremony seating layouts to see what fit best. 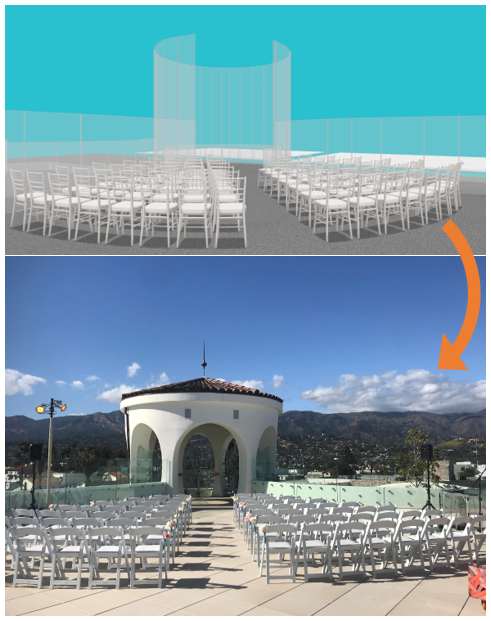 The Lookout Tower is set in the east corner of the building and is framed by the Santa Ynez Mountains, which creates the perfect setting for a couple to exchange wedding vows. After the ceremony, guests can explore the first and second floors of the museum during the cocktail reception, while the event vendors seamlessly move the ceremony chairs to the tables and prepare for the dinner service and dancing portion of the evening. This is a huge bonus for many couples, who love the idea of only having to rent one set of chairs for the event and save some their budget for fun programming! In less than a year, AllSeated has helped MOXI tap into some very exciting possibilities, and looking forward, we know this is just the beginning. They are excited to push the bar even higher with new advancements in 3D technology, better virtual communication with partners, and idea sharing with experts through the AllSeated platform. We are excited to share more stories as the MOXI events portfolio continues to grow!